World Wildlife Day - 03.03. Today is the second World Wildlife Day, observed annually to raise awareness of the threats to fauna and flora and the importance of improved conservation efforts and the fight against wildlife crime. As of 2014, there are 2,464 animals and 2,104 plants that have been labelled critically endangered and therefore face a high risk of extinction in the wild. The figures have more than doubled since 1998, when the levels were 854 and 909, respectively. The situation isn’t any better in Europe, among Europe´s 1000 species of native mammals, birds, reptiles and amphibians, more than 15% (1 in 7) are threatened with a further 9% considered near threatened. In addition, there is more than 1.5% that is already regionally extinct (IUCN Red List Status, EU). These wildlife assessments cover the continent of Europe as far east as the Ural Mountains in Russia, but excluding the Caucasus Mountains in the southeast. However, they do include the Canary, Madeira and Azores Islands in the eastern Atlantic Ocean. Let’s have a look at a few of these most critically endangered fauna in Europe. Critically endangered status means that populations have declined drastically or numbers are already precariously low or the animals presently survive only in a tiny area. Russian Federation, Central Asia — In Europe, Saiga antelope have disappeared from Moldova, Poland and Ukraine. At most 18,000 of the antelope remain in European Russia. Illegal hunting and habitat destruction caused Saiga populations to decline by over 80 percent in the last decade. Spain, Portugal — Lynx are nearly extinct in Portugal where few, if any, remain. Spain’s only two breeding populations total 84 to 143 adults. Lynx’s main food source, rabbits, became scarce after the 1940s. That, along with much of their habitat being developed, led to drastic population declines. Mediterranean Sea — With a population of at most 450 animals, this is the most endangered seal in the world. Most of the remaining monk seals live in Greece and Turkey. Their numbers continue to decline from people disturbing caves the seals use for breeding, and from fishing gear trapping the endangered marine animals. 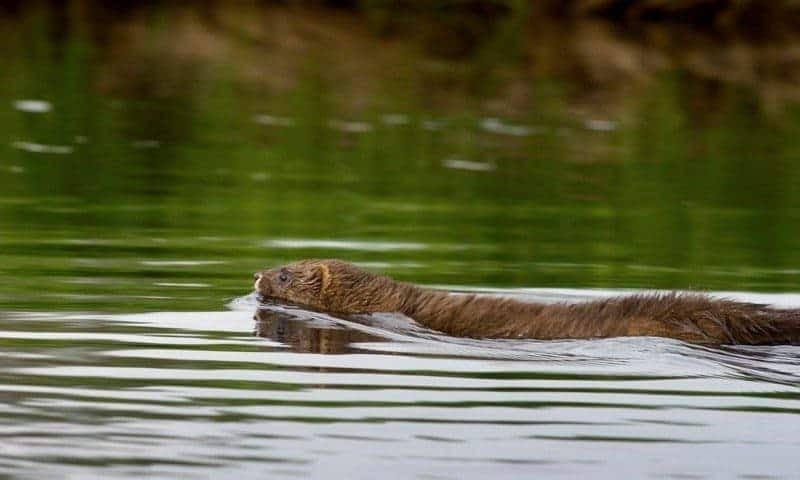 The European mink population is less than half what it was a decade ago, now only found in Belarus, Estonia, France, Romania, Russia, Spain and Ukraine. Wetland habitat loss and degradation has relegated mink to barely one-fifth of their original range. It is not just the mammals but out of the 524 bird species found in Europe, 68 (13 percent) are threatened. Some of the endangered birds whose range includes Europe are Balearic shearwater, sociable lapwing, red-breasted goose, Saker falcon, Egyptian vulture, and white-headed duck. Europe’s most endangered bird of all is the slender-billed curlew which was once common in central, eastern, and southern Europe. Its numbers declined dramatically during the last 100 years and probably now total fewer than 50 individuals. The last confirmed sighting of a slender-billed curlew was in 2001 in Hungary. Most endangered species are threatened by multiple factors, but habitat loss is generally viewed as the largest single cause of biodiversity loss worldwide and Europe is no different. When wild areas are converted to agriculture, forestry, urban development, or water projects (including dams, hydropower, and irrigation), they reduce or eliminate its usefulness as a habitat for the other species as well as reduces the ecosystem services that the landscape can provide to people. All forms of development alter natural ecosystems. Commercial forestry involves road-cutting through forests and the harvesting of trees that are important as shelter or food for some species. Dams change river flow patterns, dissolved oxygen levels, and water temperatures and may prevent fish from swimming upstream to spawn. Farmers clear land, withdraw large quantities of water from local sources, and introduce pesticides and chemical fertilizers to the environment. Ranching impacts land physically through grazing and generates air and water emissions from animal wastes. Urban development clears land and paves it, which changes local water cycles by increasing surface runoff and reducing groundwater supplies. It also generates air and water pollution from industrial activities and transportation. This is why it is imperative that Europe not only preserve its remaining wilderness areas but increase and connect those wilderness and natural areas.